Flameshield tanks are double wall steel aboveground storage tanks with interstitial monitoring capabilities. They are accredited to meet a 2-hour fire test. Flameshield tanks can be built in horizontal or vertical configurations. These tanks can also facilitate multiple compartments for multiple grades of fuel. 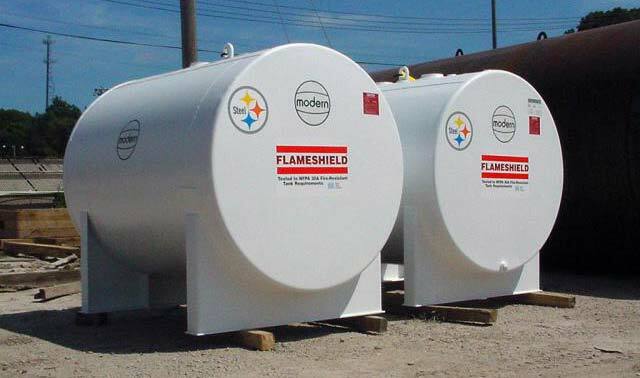 Flameshield tanks are built to Underwriters Laboratories -142 specifications and comply with AS1692-2006 together with AS1940-2004 where applicable. We offer both cylindrical and rectangular versions depending upon your footprint requirements.